We live in a fast and competitive society created by the pressure of a worldwide economy and the revolution of the digital era. Whilst competition can be positive to push us beyond ourselves, too much can be detrimental to our performance, wellbeing and health. Schools and teachers are under huge pressure to perform as are parents at work. This pressure gets passed onto our children. In addition, the social life and physical restrictions that come with being at school require adaptation that can also create frustrations and difficulties, and in turn tension in the body and mind of children. All this tension gets in the way of children’s learning. More than ever school has to create a different, more holistic way of working with children, acknowledging their individuality and the different aspects of their being. A holistic technique such as Sophrology can support schools in this approach. Sophrology is a mind/body balancing technique at the crossroad of Western Relaxation and Eastern Meditation, created by Alfonso Caycedo, neuropsychiatrist, in Spain in the 60’s. Combining breathing, simple movements and visualisation, it aims at a focused mind in a relaxed body and strengthening our capacities to deal better with life challenges. Most of all, in a time where we are encouraged to listen out to information, assessments, requirements or the likes and comments on social media, the strength of Sophrology lies in the fact that you learn to LISTEN IN. Inside there is a world of resources and possibilities waiting to be explored and channelled. In schools, Sophrology offers a space and time out of the daily routine for children to listen in to reset themselves for their day. Children will explore the sensations in their body and how they are feeling through games, mime and story-telling. They learn to let go of the physical and emotional tensions they may hold. Using their breathing, combined or not with movement or/and visualisation, they learn to calm down and befriend their emotions. The fun element of the sessions keeps children minds open and alert and encourages them to repeat these exercises outside of the classroom whenever they feel the need to. Following the principle that “what you focus on grows”, Sophrology focuses on the positive. With children, we transpose a real situation, or situation that creates anxiety, into a different imaginary context and explore feeling strong, confident or/and calm in their body and mind. We also encourage them to use their body and postures to stimulate these anchored feelings when they need to, strengthening their confidence and presence to the outside world. 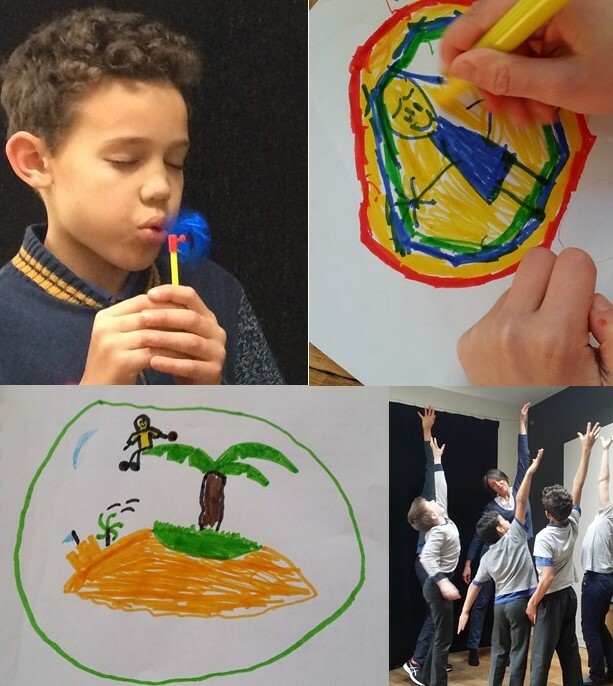 Guided into a meditative state of consciousness and/or connected to their body and intuition, children’s imagination and creativity is stimulated. Children have ideas, images, sounds, colours coming to them. Their inner world is full of possibilities and helps them look at situations and things around them with a new and more open mind. Sophrology puts children at the centre of their world; just like this little girl did when, at the first session with year 2 classes, after a guided visualisation of a safe place, she drew herself and a cat quite small in the left corner of an A4 page, and then, at the 6th session, she drew herself at the centre of the paper, filling up the whole page, with a big smile, lots of colours and surrounded by her protective bubble. An additional empowering aspect of Sophrology is the fact that there is no right and wrong way of doing an exercise; there is no mark, no judgment: there is what works for the child here and now. In this way, children get used to questioning themselves: “Does this feel right for me?” “Does this work for me?”, listening in to their needs and their intuition and to respect them. During a session, as I asked children to lie down and close their eyes for a short visualisation, a child came to me and asked with a shy voice “I don’t want to lie down and close my eyes”. I said that, as long as she let others enjoy their session, she could sit down and keep her eyes open. And this is what she did. She sat and listened with her eyes opened. At the end of the visualisation, I asked the children to draw their landscape. She came to me with a big smile on her face, a lovely drawing and a big heart in the middle of it. Although seated and with her eyes opened, she still benefited from the session in her own way. I also sensed that she felt happy that her needs were respected by both herself and me. I have also noticed that sometimes just listening and welcoming children’s emotions is powerful enough to make them feel better, be more available to people around them and open to learning. Supporting schools into a more holistic way of teaching – giving pupils a tool for life to become independent and creative learners and free and responsible citizens well-equipped to come up with the solutions to the challenges of our societies: that is what Sophrology in schools can facilitate because children will do the rest. I have noticed, and have had testimony from parents confirming, that they are a lot quicker than we think to grab a tool and intuitively make it their own! This entry was posted in Sophrology in school and tagged education, exam preparation, relaxation, wellbeing in school on 09/05/2018 by The Sophrology Network. What a fantastic article, it is absolutely spot on Laetitia Dehauteur, Go girl! Well done you!!! Lovely article Laetitia! thanks for sharing your experience in schools with us. Lovely article Laetitia! It’s always enjoyable to converse with passionate people. Passion has a power of releasing hidden talents and bringing up opportunities in life. Passion is infectious and influential phenom, used positively can lead to great things for yourself and others around… Truly inspiring! Thank you so much for your lovely comment Tatiana. Very much appreciated.